Wheeler Rex 8100 NPT 3/4"-2.00"
Wheeler Rex 8200 CTS 3/4"-2.00"
JCM 102 Univ Ext Range Coup. 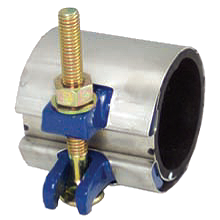 Smith-Blair offers the most complete line of Hot Tap service saddles in the industry for fast, dependable tapping of all types of pipes. Their outstanding features include the Taper Seal gasket, heavy forged bales, and wrap-around design that reinforces and supports the pipe, are combined in superior service saddles to provide low initial cost, ease of installation, and excellent lasting qualities. Available Widths: IPS 3.0", 6.0", 12.0"
© Copyright 2001-2019 PipeMan Products, Inc. All Rights Reserved. We Specialize in Hot Tapping, Line Stopping, Pipe Freezing, and Commercial Pipe Repair Products!